In the early 1990s, the Residentie Orchestra of The Hague released a series of recordings, “400 Years of Dutch Music” – I have some of the installments on Olympia, from OCD 504 to 507, the late-romantics and early-moderns (Johan Wagenaar, Matthijs Vermeulen, Willem Pijper, Hendrik Andriessen) to the contemporaries (Lovendie, Escher, Badings, De Leeuw…) – which revealed that there had been more on the Dutch scene than simply, as was commonly thought until then, nothing between Sweelinck (1562-1621) and Diepenbrock (1862-1921). Chandos here and again the Residentie pick up the flame. Alexander Voormolen (1895-1980) was a pupil of Johan Wagenaar in Utrecht, and of Albert Roussel and Maurice Ravel in Paris – more attracted stylistically, he said, to Roussel than to Ravel. I had never heard of him, and a discovery is always welcome. 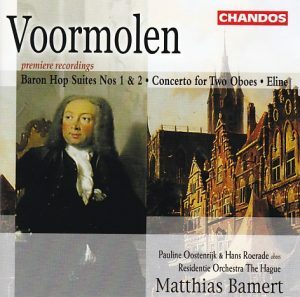 That said, there’s nothing particularly revelatory in the music of Voormolen here. It veers between the lighter and fluffier side of “musique française” – Sauguet and Auric more than Roussel –, Prokofiev’s Peter and the Wolf and Hollywood-Broadway, when not the romantic style of Ludwig Spohr or the serve-all-purpose style of Leon Minkus’s ballets. 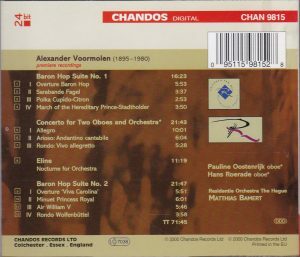 Also, Voormolen was introducted in 1916 to the Parisian musical society of Ravel, Roussel, Schmitt, Casella, Delius, Ricardo Vinès, Marguierite Long, Jacques Thibaud (and who knows which rich aristocratic patrons), and he seems to have been so marked by it that his musical style stopped there. That he should be writing that kind of music in his Baron Hop Suites (resulting from an aborted project of an opera comique), in 1924 and 1931, or in the Concerto for two oboes of 1933, “passe encore” as the French say. But he’s still doing it in 1951 in the symphonic poem “Eline” (subtitled “Nocturne for orchestra”), where whiffs of Strauss or of the neo-classical Stravinsky may be heard. The music is “pretty” and will procure enjoyment to those who don’t demand more of music than just being “pretty”.